Everybody has probably seen the infamous map of New Jersey that made its way around the internet this past month. Whether or not the map is accurate, the divisions in our Garden State are undeniably fascinating. We have our coastal shore towns, full metros like Newark and Atlantic City, farmland to the west, the Historic sites of Princeton and Morristown, and then there’s Sussex County. I think that map does not characterize our northernmost county accurately. With its open fields, horse shows, and hunting enthusiasts, its become apparent to me that Sussex is the land of the North Jersey Cowboy. Sussex County is our Texas. The Place – When I journeyed to the wilds of Sussex County, I found the Homestead perched practically by itself on the side of a dark road. When I first walked in, I got the distinct feeling that I had entered a cowboy bar complete with country music lightly playing in the background and the rough and tumble restaurant crowd (I definitely saw some beards even bigger and more haggard than my own overgrown goatee). The bar area can get crowded and the constantly opening door can make it a bit cold in the winter, but never fear, there is a large, well-lit dining room right around the corner. This decor is the definition of rustic with wood, wood everywhere. With the hardwood floors and thick wood tables to the exposed wood walls covered with pictures of award winning Sussex County horses and celebrity cowboys, you feel like you’ve stepped into a warm and welcoming farmhouse, quite a departure from the diners and burger joints my food adventures normally lead me too. Menu- The menu is as ‘country’ as you’d expect, with menu choices like Steak cuts, Pulled-pork Sandwiches, Chicken selections and even Chicken Fried Steaks. 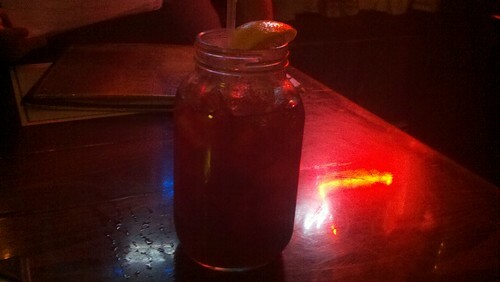 If you order ice tea, don’t act too surprised when it comes served in a mason jar, complete with straw and lemon wedge, of course. For an appetizer, I have to recommend the Homestead Chips. No Lays-style potato chips here. 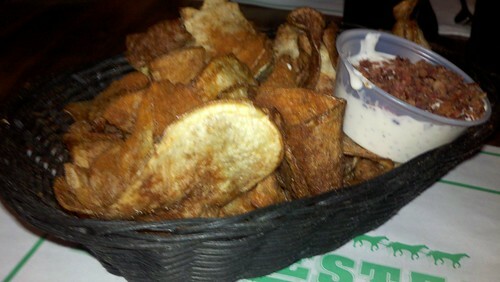 These heavily fried slices of potato are served with a bleu cheese bacon dip, very cool. One of the dinner dishes I had to try was a plate of Venison. I’ve had venison before, and I know most people are afraid to order it in a restaurant, but I can’t imagine why. Its a very savory meat, and, while it is gamier than beef or steak, it isn’t too tough. 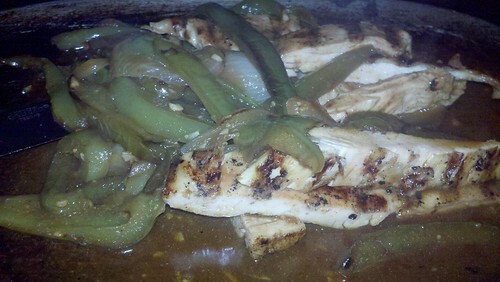 Its actually very flavorful, and its a dish any omnivore should try. Burgers- Even though the rest of the menu was tempting, the reason I went all the way up to Sussex County was that I heard the Homestead had great burgers. There’s a dozen alluring burger choices here at the Homestead like the The Pale Rider with Brie Cheese, onions, bacon and watercress; the Hang ’em High with American cheese and Taylor Ham; or the Outlaw Josey Wales, with a spice-rubbed beef patty topped with white cheddar, grilled onions, pickled jalapenos and poblano ketchup. There’s even a Burger challenge: the 2 lb Homestead Legend Burger, which you have to eat in a half hour so that you can sign their ‘Champion’s Book’. For the sake of my review, I had two different burgers. I went with the Star in the Dust burger. Before I even start, I just want to point out that it has the coolest name of any burger I’ve eaten this year. I was a bit perturbed when it was served to me, though, because the menu says that it had a jalapeno and pineapple chutney, where as the burger itself has jalapenos slices and grilled pineapples. The Homestead either has to update their menu or review the definition of a chutney. Lucky for the Homestead, I love the sweet and spicy mix of fruit and peppers, so there was no way I was going to complain about the substitution. 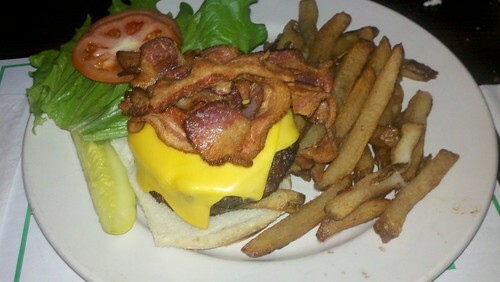 Also topping this burger was a mound of delicious bacon and…oh, man, check out the cheese. It looks like mozzarella but it is absolutely cream cheese. I might be the resident burger expert at Jersey Bites, but I assure you, I have never had a burger with cream cheese on it! I appreciate that the a whole slab of cheese was stacked on there for presentation of the plate, but I had to cut some of it off and shave it down before you could fit it in my mouth. When I tasted the Star in the Dust, I tried to get a bite with all the components, and it was a great sweet and spicy blend. The beef was a thick burger that you could tell was beaten into a patty by hand. The cream cheese cools the jalapeno and the pineapple sweetens the whole burger. This was really great, and I love the mixing of all the unique flavors in this burger. If you’re looking for a more normal but (slightly huge) burger, you could try the Two Mules for Sister Sara burger. 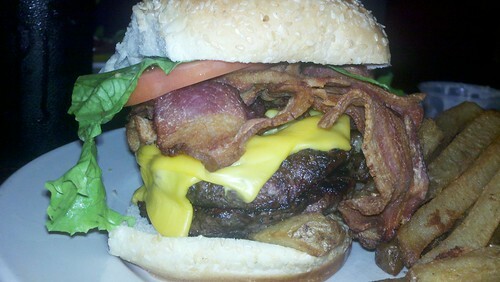 This burger had two beef burger patties piled high and topped off with American cheese and a copious amount of bacon. 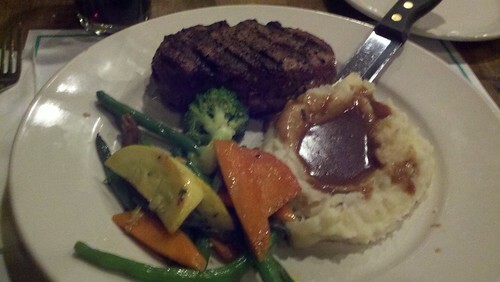 The beef was great, and again tasted like it was beaten into a patty in the kitchen. The bacon was tasty, with thick slices of meat that were fried just right and not slicked with grease. The burger was served with a side of slice potato fries with the skin still left on them and heavily salted. 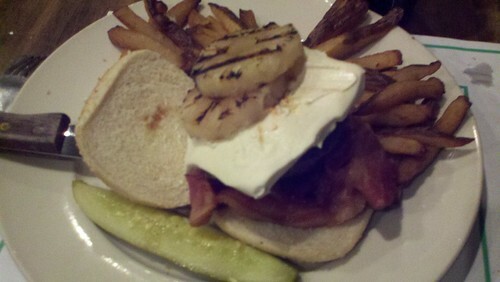 This burger was above average, and I’d even take the trip all the way up to Lafeyette again just to have it. I had gone to the Homestead a few times for this review, in fact, and I am yet to be disappointed with their food. I might even try that Legend burger next time and I’ll see if I can get in their ‘Champions Book’. 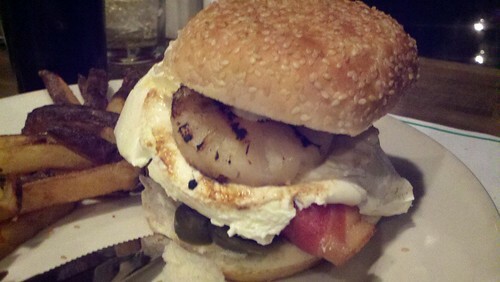 I actually think it was cool to find burgers like these at a place that was so distinctly Un-Jersey. 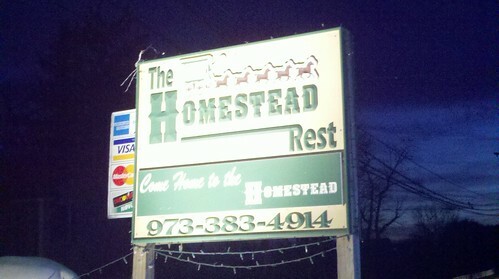 I normally find myself at Diners and Burger Joints, but the Homestead was a bit of a surprise for me. So if you want to have a burger in one of the further reaches of New Jersey, go and see how they do it up in Sussex. Ah, New Jersey. Its our wonderful and confusing state where you have to go North to find a piece of the South. New Jersey Nick – If the Jersey Devil was 6’1″, overweight and bearded, his name would be Nick. New Jersey Nick can not cook without the aid of a microwave, but, thanks to an iron stomach, he has learned about food by being a fearless and adventurous eater. A self-proclaimed Burger Expert, Nick forgoes fancy restaurants to get a taste of all the ‘good food that’s bad for you’ from New Jersey’s Diners and Burger Joints. When he’s not writing about food, Nick spends time on his other hobbies as an Xbox enthusiast, a Horror Movie Savant, a Nascar follower, a Comic Book Reader and a Pro-wrestling fan. Just like Batman, Nick has a day job in the real world that isn’t as interesting as his alter ego. You can read more about Nick’s adventures on his site at www.newjerseynick.com, follow @newjerseynick on Twitter or ‘like’ him on Facebook.